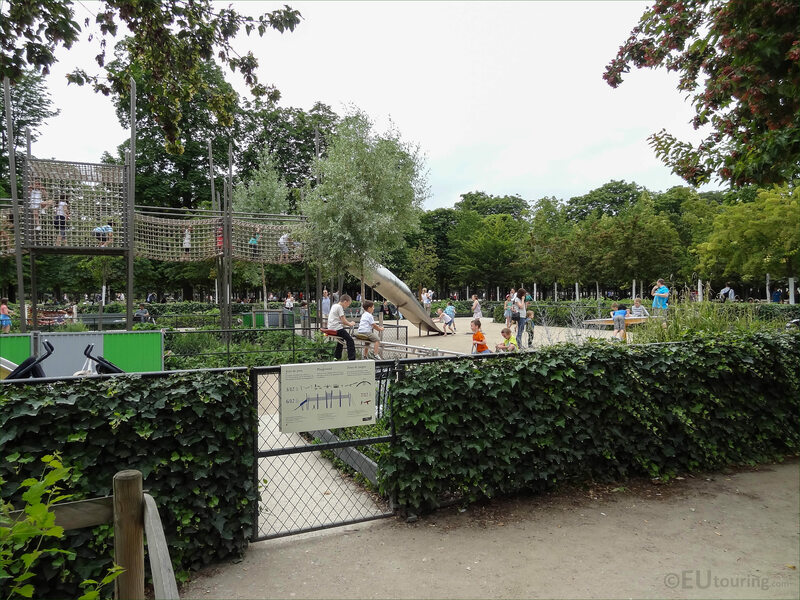 Even though the Jardin des Tuileries is classed as an open air museum, there are activities for children as you can see from these high definition photos we took of the childrens playground. 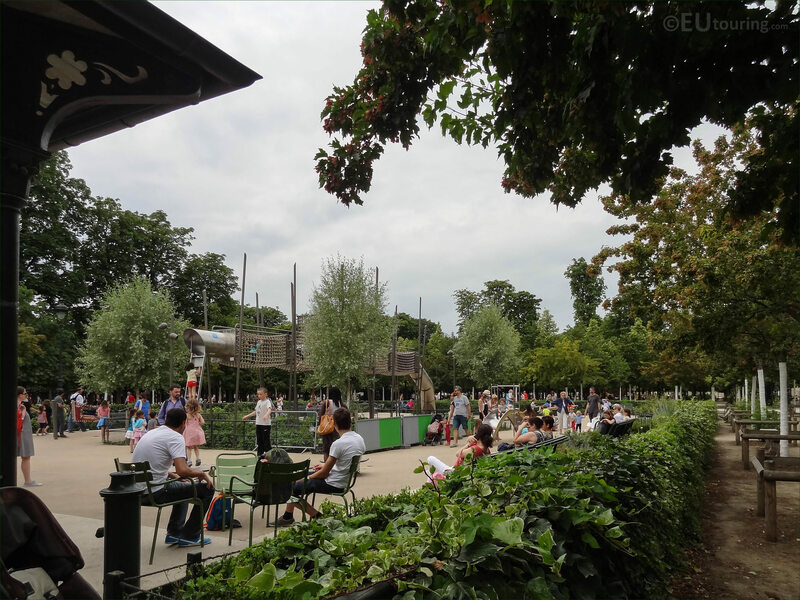 Called an Air de jeux in French, this first HD photo shows an area within the Jardin des Tuileries that has been designated as a childrens playground, and this can be found within the northern part of the gardens in the Grand Couvert area. 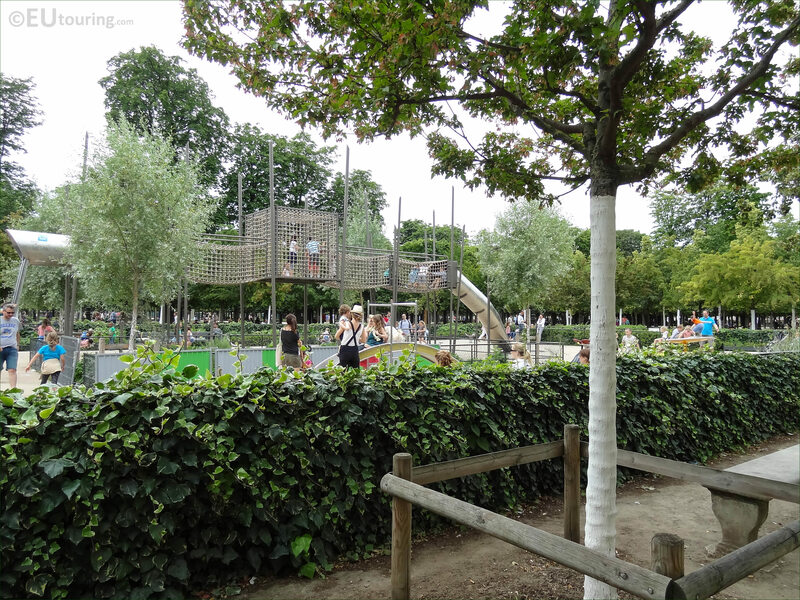 France in general is very family orientated, so you will be able to discover numerous playgrounds, facilities and different entertainments designed for children throughout the capital, which are enjoyed by locals as well as tourists on holiday in Paris, just like this adventure playground within the Tuileries Gardens. 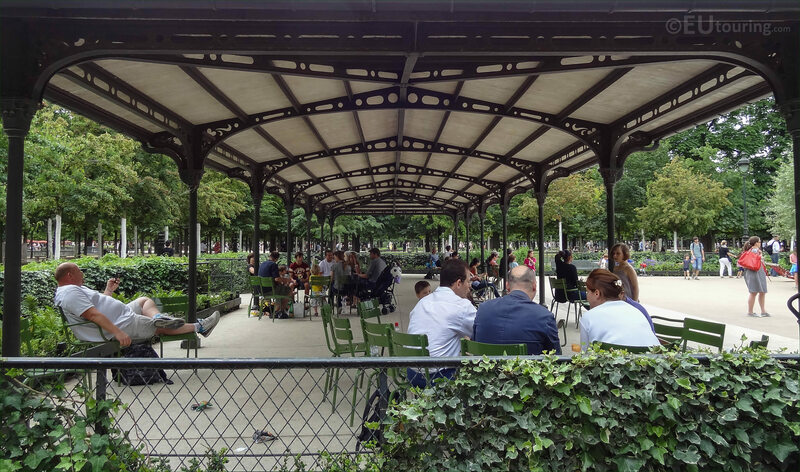 However, within this area of the Jardin des Tuileries in one of the sections known as a parterre in the Grand Couvert section, you will see that right next to the childrens playground, there is also a covered pergola style shelter where the adults can relax and watch their children play happily in a safe and secure environment. Now we took this photo looking over to the Aire de Jeaux with its entrance gate, as we were standing in the Allee des Feuillants, which is one of the areas within the Tuileries Gardens that is a tree lined ally on the northern side of the Jardin des Tuileries close to the Rue de Rivoli. 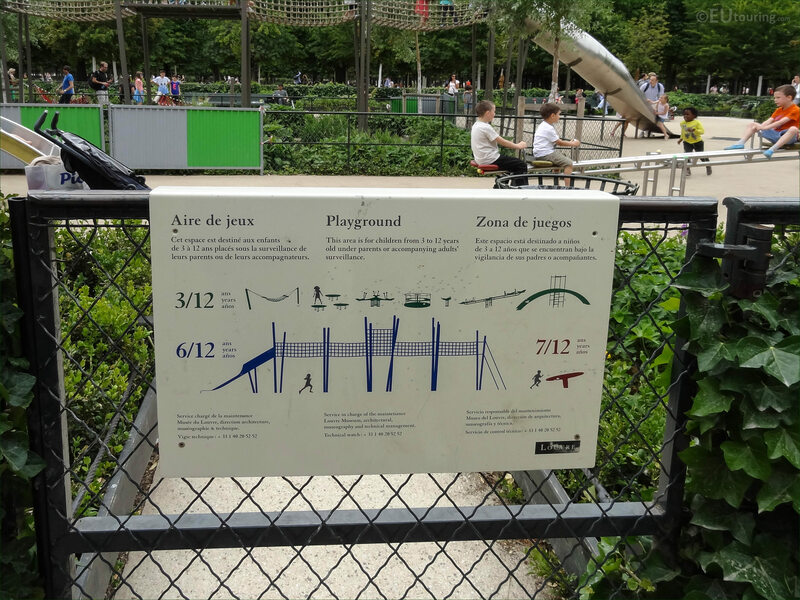 Yet here you can see a close up photograph we took showing the information board on the entrance gate to the Childrens Playground, which as you can tell, has the information written in French, English and Spanish, along with details about the types of apparatus suitable for different ages, and this area is also managed by the Musee du Louvre. 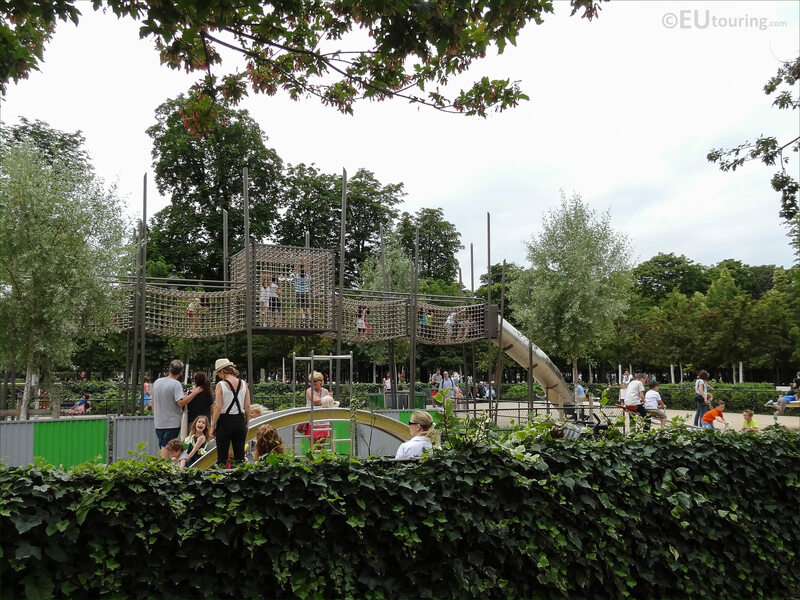 So even while you are in the historical open air museum of the Tuileries Gardens, you can still let your children have some fun, and as well as this Aire de jeaux, there is also a carousel and trampolines, along with model boats they can sail on two of the smaller basins during the warmer months.